[T]he phrase "West Indies" distinguished the territories encountered by Columbus or and claimed by Spain from discovery claims by other powers in [Asia's] "East Indies"... The term "West Indies" was eventually used by all European nations to describe their own acquired territories in the Americas... considering British Caribbean colonies collectively as the "West Indies" had its greatest political importance in the 1950s with the movement to create a federation of those colonies that could ultimately become an independent nation... Despite the collapse of the Federation [in the early 1960s]... the West Indies continues to field a joint cricket team for international competition. ^ "Two telegrams about the sale - The Danish West-Indies". The Danish West-Indies. Retrieved 2017-10-13. ^ "Info Please U.S. Social Statistics". Retrieved 1 October 2015. ^ Rosanne Adderly, "West Indies", in Encyclopedia of Contemporary Latin American and Caribbean Cultures, Volume 1: A-D (London and New York: Routledge, 2000): 1584. ^ "West Indies | History, Maps, Facts, & Geography". Encyclopedia Britannica. Retrieved 2019-03-12. ^ a b c Ricklefs Robert; Bermingham Eldredge (2008-07-27). "The West Indies as a laboratory of biogeography and evolution". Philosophical Transactions of the Royal Society B: Biological Sciences. 363 (1502): 2393–2413. doi:10.1098/rstb.2007.2068. PMC 2606802. PMID 17446164. ^ "Flora of the West Indies / Department of Botany, National Museum of Natural History, Smithsonian Institution". naturalhistory2.si.edu. Retrieved 2019-04-14. ^ a b Graham, Alan (2003). "Geohistory Models and Cenozoic Paleoenvironments of the Caribbean Region". Systematic Botany. 28 (2): 378–386. ISSN 0363-6445. ^ Santiago–Valentin, Eugenio; Olmstead, Richard G. (2004). "Historical biogeography of Caribbean plants: introduction to current knowledge and possibilities from a phylogenetic perspective". TAXON. 53 (2): 299–319. doi:10.2307/4135610. ISSN 1996-8175. ^ Iturralde-Vinent, Manuel A. (2006-09-01). "Meso-Cenozoic Caribbean Paleogeography: Implications for the Historical Biogeography of the Region". International Geology Review. 48 (9): 791–827. doi:10.2747/0020-6814.48.9.791. ISSN 0020-6814. ^ a b geolounge (2012-01-08). "Caribbean Islands: the Greater Antilles". GeoLounge: All Things Geography. Retrieved 2019-04-14. ^ Santiago-Valentin, Eugenio; Olmstead, Richard G. (2004). "Historical Biogeography of Caribbean Plants: Introduction to Current Knowledge and Possibilities from a Phylogenetic Perspective". Taxon. 53 (2): 299–319. doi:10.2307/4135610. ISSN 0040-0262. ^ "The University of the West Indies Seismic Research Centre". uwiseismic.com. Retrieved 2019-04-14. 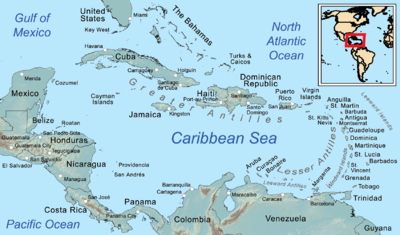 Wikimedia Commons has media related to Subdivisions of the Caribbean. Cromwell, Jesse. "More than Slaves and Sugar: Recent Historiography of the Trans-imperial Caribbean and Its Sinew Populations." History Compass (2014) 12#10 pp 770–783. Jones, Alfred Lewis (1905). "The West Indies" . The Empire and the century. London: John Murray. pp. 877–882.